Federal emergency relief officials have provided new details on their decision to reject California's request to reimburse the state for work to rebuild and reinforce the badly damaged spillways at Oroville Dam. The Federal Emergency Management Agency announced earlier this month that it would not reimburse the state for $306 million in construction on the spillways, which failed in February 2017 and prompted mandatory evacuation orders for 188,000 people living downstream of the nation's tallest dam. In a brief statement March 8, a FEMA spokesperson said the agency was refusing to reimburse the California Department of Water Resources (DWR) for work on the upper portion of the dam's main concrete spillway. The agency said the decision was based on earlier engineering reviews that found "a variety of problems existed at the dam" before the sequence of events that led to the spillway crisis. In a follow-up memo sent last week to the California Governor's Office of Emergency Services, FEMA said reimbursement had been denied for two separate phases of the spillway recovery work: rebuilding the upper 1,500 feet of the main concrete spillway and extensive reinforcement of the adjacent hillside that serves as the dam's emergency spillway. Federal emergency officials argued that while the nearly total disintegration of the lower half of the chute can be attributed to events in February 2017 -- events covered by a presidential disaster declaration -- that's not the case for the upper part of the spillway, which suffered no visible damage during the incident. FEMA's memo noted that an independent forensic team found last year that poor design, construction and maintenance of the spillway made its failure "inevitable." The agency said those long-term factors explain damage to the upper spillway -- and make that part of the structure ineligible for disaster funding. FEMA can pay 75 percent or more of qualifying expenses for disaster recovery efforts, and has reimbursed the state for $333.4 million of its costs to date — including $128.4 million granted last year for the initial emergency response to the disaster and $205 million announced recently to pay for replacing the lower portion of the spillway. The Department of Water Resources, which had submitted $113.2 million in costs for the upper spillway reconstruction, said Tuesday it will appeal the FEMA's decision. "FEMA’s determination memo points to technicalities and the need for additional information to support why something is eligible," said DWR spokeswoman Erin Mellon in an email. "As we’ve said before, DWR believes all reconstruction work is eligible for reimbursement and we’ll be providing additional information to FEMA during the appeals process." The federal agency also rejected a request for $193 million in costs related to work on the emergency spillway -- an unlined hillside covered with brush and trees adjacent to the main spillway. 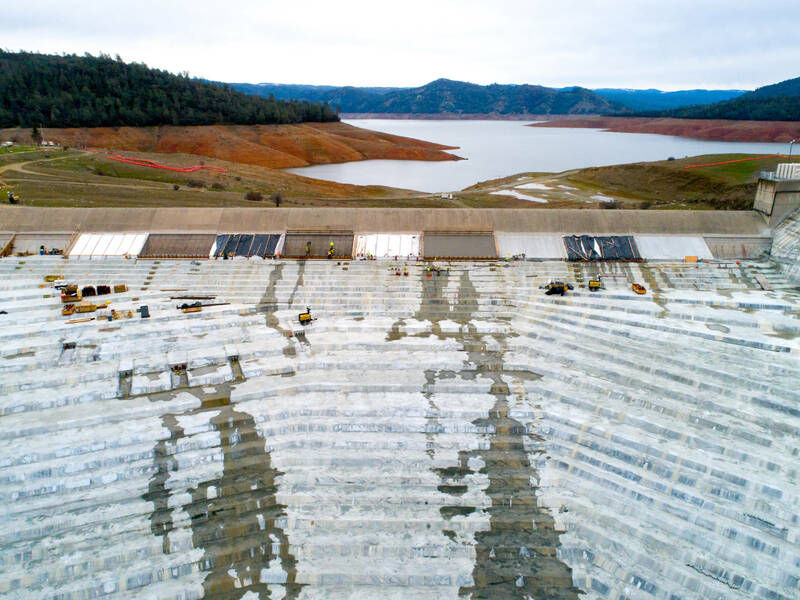 It was the rapid erosion of that slope -- and the potential threat to a quarter-mile-long concrete weir adjoining the main spillway -- that raised fears of a catastrophic release of water from Lake Oroville and prompted orders for communities downstream to evacuate. In the wake of the crisis -- the first time the emergency spillway hillside had been used in Oroville Dam's 49-year history -- the upper portion of the emergency spillway hillside was reinforced with a variety of structures. Those include a "cutoff wall" made of massive concrete piles that reach as deep as 65 feet below ground level, as well as a buttress and splash pad designed to protect the emergency spillway and dissipate the energy of any future overflows. In its memo, FEMA said the work is not eligible for reimbursement because the original hillside was not maintained and because the recent improvements to the emergency spillway are actually new, permanent structures. Updated to add Department of Water Resources' response to FEMA's memo.